Webb & Company Architects' principal Marvin Webb received his Bachelor of Architecture Degree from the University of Nebraska-Lincoln College of Architecture in 1971. As a registered professional architect, Webb has been a member of The American Institute of Architects since graduating in 1971. He has had 36 years of experience working with a variety of architectural firms in Omaha, Lincoln, and the last 26 years in Grand Island, Nebraska. 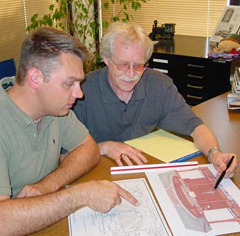 Webb & Company Architects offers design related services in architecture, historic renovation, land planning, site analysis and existing facility analysis. WCA provides superior quality and innovative design services. Our architectural firm approaches each project with enthusiasm for integrity, honesty, and inclusiveness of the Client and end users as an integral part of the design process. Although WCA is well known for our variety of local and regional commercial facilities, the firm has become increasingly noted for our experience in historic renovation projects. WCA is strongly committed to historic communities’ "Downtown Revitalization" in the adaptive re-use of existing historic buildings for today’s new use and occupancy. WCA approaches our clients’ unique needs of each different project by assembling a "Team" of architects, mechanical, electrical, civil and structural engineers with experience required to design your project.